Are you familiar with the following message? 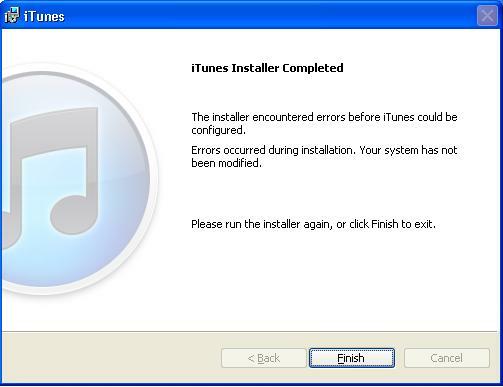 'The installer encountered errors before iTunes could be configured. Errors occurred during installation. Your system has not been modified. Please run the installer again, or click Finish to exit'. 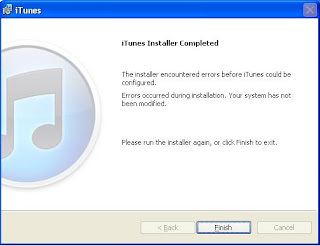 Quite clearly, a technical problem occurred during the installation of iTunes and the process could not be completed. Without more information, it is impossible to say exactly what caused the problem. Un-installing all Apple related components through the 'Add or Remove Programs' utility in the Windows control panel. Removing remnants from the 'Program Files' folder and registry. On this particular occasion, this procedure didn't work. The installation of iTunes rolled back time and time again and resulted in the error above. Using the logging facilities built into the Windows installer, I was able to identify the problem was with the installation of one of the iTunes components, Apple Mobile Device. Essentially, a device driver for USB connectivity to Apple hardware was failing to install. Unfortunately this did not work either and the 'Apple Mobile Device' module could not be installed separately either. On the particular machine I was working on, accessing this key simply resulted in an error. It seems the permission settings for this key had become corrupt. Right clicking on the 'DriverStore' key, then clicking 'Permissions'. Clicking on 'Add', then typing in 'SYSTEM' in the new panel that appeared before clicking 'OK'. Clicking on the 'SYSTEM' object I had just added, then ticking the 'Full Control' box and clicking 'OK'. After rebooting the system I was able to reinstall iTunes successfully. I would be interested to hear if anyone else has had the same problem and if they were able to resolve it. Thanks for this Matthew, followed all steps including installing REVO uninstaller which clears out registry keys when Apple sw uninstalled. Alos could not install Apple Mobile Device separately. Modifying key permissions did not help, so currently still just seeing same message top, front and centre above "The installer encountered errors before iTunes could be configured " - I am beginning to have bad dreams about that phrase..
any other suggestions? How do I interrogate the windows installer log? Assuming you can, it is probably caused by a different problem. I would suggest using Process Monitor (http://technet.microsoft.com/en-gb/sysinternals/bb896645.aspx) to try and establish what is happening when the error occurs. I also found myself having rage issues with taht phrase =X. By i appeared to fixed it by simply right clicking the installation icon and run it at administrator... I felt very stupid, but i hope it works for you. Thanks Rodrigo, simply running it at administrator worked for ME! Rodrigo, I have been on tech blogs all day over this. I know we are all secretly hoping for the quick easy fix. I was so far down in the expert level tech help abyss by the time I found your post that any sane non-expert would have taken a hammer to the laptop and just bought a new one. When I found Matthew's post I knew instantly my root problem was very similar but I was not sure I had the knowledge and resolve left in me to try his process. Poor Mathew has the skill and methodical determination to spend hours figuring out the exact correct issue and then you come along with the layman's short cut and steal all his glory! This worked and it was so simple that my stress headache and rage melted away like butter. BRB, gotta go post your short cut to all the websites that failed me for the rest of the moms out there who WANT to be like Matthew but still have laundry to fold, dinner to cook, and $7 in a pocket somewhere we need to find because our kid needs concession stand money for tomorrow. how do u do that lol, can u tell me how to change driver keys in the registry? because i have no clue how. Do you think apple will just fix this anyway? Right clicked. Ran as administrator. Worked. Thanks sooo much for the simple fix. Yes, that worked ... right click the installation file and run as administrator. Previously the screen went dim and asked permission automatically but obviously this did not do the job! What I tried that worked was run as administrator as said and then I moved where it would the iTunes program would be located. This worked for me :) good luck all.